Its Saturday morning, Charles and I woke up early to a fresh pot of coffee. We got dressed, packed up our fishing gear and Go pro camera to take fishing and film some video for our you tube channel. We stopped at Hoods to check out their deals (which was disappointing because everything was practically retail) so we didn't stay long. We started driving to our usual fishing spot, when a NAME came ringing in my head. Its been almost a year since we started our tiny cabin project and we've been trying to come up with a name ever since. I said it out loud, with Charles in the drivers seat. He looked at me, smiled, and said... "I like it!" Long story short, it took a year, but we have a name that truly defines our tiny cabin. A cabin the size of a shack (being 116 square feet), and being finished and designed with class! 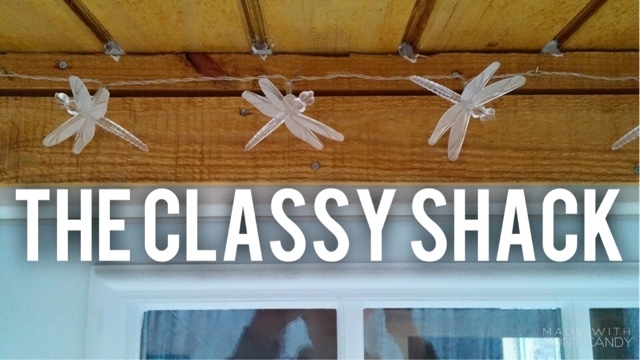 There you have it, and welcome to our journey with the classy shack! As always, thank you for reading and make sure to follow my blog!